A widespread species that has been recorded in Nigeria, Egypt, Cameroon, Ghana, Kenya, Niger, Liberia, Sierra Leone, Sudan, Benin, Ivory Coast, Guinea, Chad, Togo, GuineaBissau, Senegal and Ethiopia. 15″ (37.5cm), although specimens up to 20″ have been recorded in the wild. 48″ x 24″ x 24″ (120x60x60cm) – 430 litres. S. schall is a particularly voracious feeder but is generally unfussy. Frozen, live and dried foods are all accepted. It also relishes vegetable matter in the form of shelled peas, cucumber etc., which it will rasp at with the teeth in its lower jaw. This is a very robust species and should be kept only with tankmates that can stand their own ground such as large Central American and African cichlids, large characins and barbs and loricariids. It will eat smaller fish and can be unpredictable; some specimens can be housed with other fish with little problem, while others take exception at anything invading their personal space! We recommend it is the last fish to be introduced to a community in order to minimise the risk of aggression. The female is plumper than the male when adult. It can also be sexed by examining the genital papillae. This is not for the amateur however. The fish should be held ventral side up in the palm of your hand and the dorsal fin taken between your middle and ring fingers in order to avoid being pierced by the sharp dorsal fin rays. The genital area you are looking for is concealed beneath the pelvic fins. This can be exposed by pulling (gently) on the caudal fin. A male fish will exhibit an extended papillae which should be pointed and ridged. The spermatoduct can be seen on the caudal side. Females also have a clearly visible papillae but this is more rounded and the oviduct is on the opposite side to the male’s spermatoduct. Most species of medium/large Synodontis can be sexed using this method but it should be noted that most species take 2 years or more to reach sexual maturity. 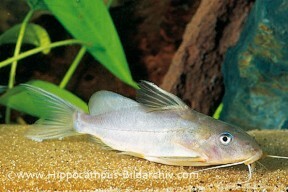 Not recorded in aquaria but is bred in ponds and irrigation canals in its native lands. 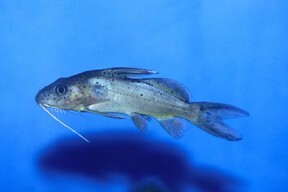 In nature S. schall breeds like other riverine Synodontis in areas of seasonal flooding that are rich in micro-organisms. They are egg scatterers and exhibit no parental care. S. schall is regarded as the ‘bad boy’ of the genus in aquarium circles. It is randomly aggressive and not particularly attractive. It is often confused with other similar species of Synodontis such as S. budgetti or S. clarias but can be distinguished by the length of the adipose fin which, in this species, is very long and runs from just past the base of the caudal fin to just before the caudal fin. It is an important food fish in some of its native countries.